Indulge the senses with our award winning line of unique and upscale delectable snacks, VIP Deluxe is packed to the brim and overflowing with gourmet delights including 2 bottles of Personalized Cabernet Sauvignon Wine, Jam, Gourmet Crackers, Pecan Caramel Turtles, Chocolate Meltaways, Creamy Chocolate Covered Oreos, Gourmet Cashew Crunch, Fancy Tea, Godiva Chocolate Boxes, Ghiardelli Chocolate Bars, Gourmet Pretzels, Dark Raspberry Ghiardelli Squares, Brent & Sams Cookies, Pretzel Crisps, Fancy Gourmet Licorice, Freshly Roasted Nuts, French Twists, Gourmet Table Crackers, Butter Crunch Peanut Squares, Walker Shortbreads, Chocolate Truffles, Chocolate Q Bits, Nutella Hazelnut Cream, Godiva Chocolate Bar Creme Brulee Wafers and many many more gourmet delights. You will dazzle them with this extravagant medley that truly conveys your good taste and sincerity. Recipients will always remember your generosity. 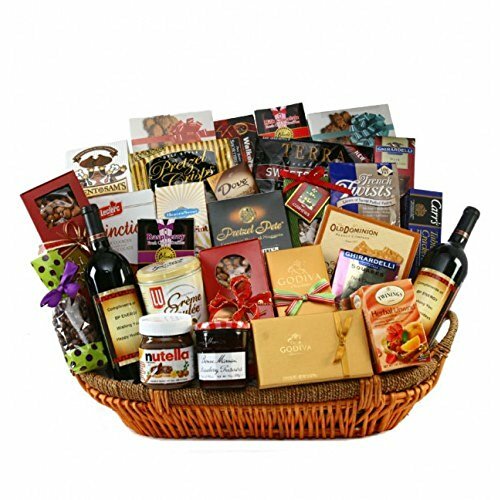 Gift basket includes: 2 bottles of Personalized Cabernet Sauvignon Wine, Jam, Gourmet Crackers, Pecan Caramel Turtles, Chocolate Meltaways, Creamy Chocolate Covered Oreos, Gourmet Cashew Crunch, Fancy Tea, Godiva Chocolate Boxes, Ghiardelli Chocolate Bars, Gourmet Pretzels, Dark Raspberry Ghiardelli Squares, Brent & Sams Cookies, Pretzel Crisps, Fancy Gourmet Licorice, Freshly Roasted Nuts, French Twists, Gourmet Table Crackers, Butter Crunch Peanut Squares, and many many more gourmet delights.